Asthmatic Kitty, the label founded by Sufjan Stevens, has been quietly assembling a group of artists who produce soft experimental music with intense, often spiritual, lyrical concerns. Castanets -- essentially the peripatetic Raymond Raposa -- has found a perfect home here, bringing country music and old-time religion together among the avant. On Cathedral, Castanets' debut album, Raposa starts with a country-folk sound, but steadily brings in odd noises and unusual song structures in order to create something original. Most of the songs rely on acoustic or slide guitar, backed with steady percussion. The synthetic effects round out the song and develop atmosphere, and they never sound like novelty for the sake of novelty. Each track is carefully constructed and performed -- the precision supporting the importance of Raposa's vision. With a voice that wouldn't be out of place on an old country LP (even if his music would be), Raposa is emotive but restrained, with a slight twang that you almost wish would break out into a yodel. Liz Janes, another Asthmatic Kitty artist, joins him occasionally, always with tasteful back-ups and tight harmony. 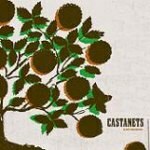 The lo-fi production helps develop (or maybe contain) the darkness of Castanets' music. Cathedral sounds as if it was recorded in the desert at night, which suits the pre-technology fears of the album. Raposa's faith and doubt are essentialized concerns as applicable to contemporary life as they would have been 100 years ago. For every Hank Williams moment on this album, there's a Robert Johnson lurking in the self-constructed shadows. On "No Light to Be Found (Fare Thee Faith, The Path Is Yours)", Raposa sings, "I had a dream so black / That I could not tell," but much of Cathedral is that telling. This track focuses on losing love, and the struggle to maintain in the face of doubt and naysayers. To hold on to his beloved, Raposa has to take her, as well as the relationship, on faith. He doesn't know where she's been or "where the hell" he is, but he continues to search. The power of both Raposa's faith and his doubt comes from their lack of completeness, from their exchange with each other. Raposa never shakes the specter of despair, but he never turns to embrace it either. Rather than in success, Raposa's resistance takes the form of a strong yet small hope. He ends the album's noisy opener, "Cathedral 2 (Your Feet on the Floor Sounding Like the Rain)" by intoning the thought that supports him: "It's alright to want more than this". When it seems impossible to fulfill desire, you have to maintain the rightness of that desire. While that idea aids those caught in struggle, in also serves as a scriptural-based rebuttal to ascetic strains of Christianity. Too often, Christians associate desire with guilt, failing to recognize the concept of "life more abundantly". By making his claim at the start of an album that will grow more explicitly religious, Raposa positions himself on the other side of his faith. Doing so on the opening track also enables him to merge his aesthetic and thematic concerns into a more powerful union. Like his dream, Raposa's music comes from a very black place. His use of minor chords and repetition builds an insistent enclosure, but it's within this very structure that Raposa can poke the pinpricks of light. The troubled sound of Cathedral gives Castanets a spirit-broken authenticity that, in turn, enables the optimism and the desire to maintain a practical, and seemingly necessary, role in the discussion. Raposa ends the album with a matched pair of songs: "We Are the Wreckage" and "Cathedral 4 (The Unbreaking Branch and Song)". The first number sets down the problem of the battered life before announcing, "I'll rejoice where you are". The music opens on this track, adding a major progression and a glockenspiel to help with the emotional lift, even as the closing guitar chords hold back the joy. "Cathedral 4" enjoins us to "remember it brightly over breakfast", but the eighth-note acoustic strumming keeps suspense as Raposa adds, "You've got this flesh and you can't lose it / This body's a test but you can't prove it". He starts to tell us not to want, but then he adds "we know not to suffer", applying a definition of want different from the one he used earlier. The song adds in some electric guitar and continues forcing the opening begun in "We Are the Wreckage", with its ideas of compassion toward those who hate and domestic manger-building. The album ends ambiguously, as it should, with Raposa's concerns about the lack of direction in this life. By this point he's shown us his black dream, but he's also shown us that we might wake up from it. Raposa can't give us what we don't have, but he does give us companionship and a release from guilt, two gifts often lost in strict religion, but freed through faith.